"Oh, what it takes out of me to lay by your side!" 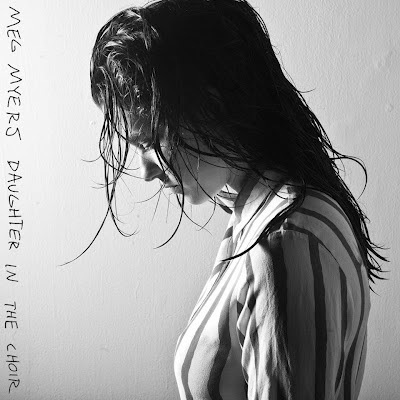 wails Meg Myers in the finale of her new EP, Daughter in the Choir. For Myers, love and pain are inextricably intertwined, and she grapples with this dichotomy throughout the six-song set. She doesn't do so as an outmatched victim - it's clear that she's more than capable of fending for herself - she just can't shake the possibility that she likes the pain. Masochistic white female singer-songwriters aren't exactly a rare commodity, but with this splendidly crafted debut Meg Myers fairly positions herself alongside some of the best of them: Fiona Apple, Lana Del Rey, and even this generation's patron saint of pop/rock kvetching, Alanis Morissette. Like many of the most successful predecessors, Myers' effectiveness largely results from pairing her considerable talents as a performer with the right producer, as with Morissette and Glen Ballard or Amy Winehouse and Mark Ronson. One key difference in this case is that both Myers and her brilliantly matched producer Doctor Rosen Rosen are both relatively new to the stage, while Ballard and Ronson had been around a while and played more guiding (and typically patriarchal) roles. Since Myers and Rosen have more than enough talent to ameliorate their shortage of experience, their partnership is just as sturdy as those mentioned, but they offer the added thrill of two brilliant new minds breaking rules without even knowing them (this same energy elevated Yasmin and Labrinth's collaboration on the single "Finish Line"). Somewhat in the vein of Lana Del Rey's Born to Die, Daughter in the Choir takes the conventions of the rock genre and fastidiously infuses them with electronica. It sounds, and more importantly, feels like rock music, a milieu Myers inhabits with full authenticity, but it's laced with subtle yet potent stylistic spices from outside the genre's usual playbook. The intersection of disparate genres is almost always sonically interesting even when it doesn't work, which this does. Yet the particular mix of rock and electronica contains an intriguing temporal element as well: rock music increasingly seems founded on a time that's passed, while electronica is self-consciously contemporary if not futuristic, and in these postmodernist times it's the only musical genre in which innovation is still being attempted at all. * On Daughter in the Choir, the electronic influence introduces itself less than half a minute into the opening track, "Curbstomp," when dense guitar-ish chords suddenly give way to the sputtering beat and vascillating synthesized scales that shape the bulk of the track. Throughout the rest of the EP, guitar- or piano-based accompaniments are either joined by or filtered through electronic production elements (the album's instrumentation owes much to Sgt. Pepper's Lonely Hearts Club Band). By the time the dubsteppy remix of the closing number "Monster" arrives, it almost seems like a logical next step. Keeping everything down to earth is the confident presence of Myers' vocals. The singer is never overshadowed by production elements largely because Doctor Rosen Rosen isn't showing off or trying to outdo her, but Myers is powerful enough that she would likely have held her own even if he tried. Her husky, almost boyish tone when in full voice lends itself well to the material; she can sound angry or agonized with just the slightest adjustment as needed. Myers does make a few quick trips into the stratosphere to make a point here and there and show that she can belt when she wants to, but not so much as to suggest that her voice and its abilities are the main focus of the performance. This makes her falsetto descants rather breathtaking when they make the occasional appearance, as in the background of "Curbstomp" and the chorus of "After You." In Myers' vocal performance, no trick is overdone, nothing is in excess, and everything serves a purpose. Like a great actor, she understands the importance of "levels," and using many of them. This is especially effective on "Monster," wherein Myers leapfrogs from one level to another and then another with such deftness that she commands the listener's full attention to the last second. Since it's content that Myers is working so diligently to put across, it's fortunate that the material is solid to begin with. It's some heavy, angsty stuff to a large degree, being as it is a meditation on love and pain, but it's interesting to hear her explore the theme from all different angles. "Monster," which sums up the thesis of the set, finds Myers choosing not to martyr herself because of her wounds but instead to take it out on the one in the wrong; when she suddenly sings the lyric "But I gotta kill you" on the chorus it's almost like a dark punch line. "Curbstomp" is a dirge-like confessional that effectively sets up the album's tone and themes up front. "Adelaide" is a tortured, schizophrenic reworking of Morissette's "Mary Jane" with a killer chorus that becomes an anthem for wronged lovers everywhere. Myers breaks up the gloom, though, with a pair of songs showcasing a sense of humor Morissette didn't develop for years, and the perspective in which it places the serious pieces actually enhances their believability. "Tennessee," an off-the-wall interlude of silliness and sarcasm that hearkens back to Sky Ferreira's "Haters Anonymous," lightens the mood after the dark opening bits, and "Poison," which first appeared on Doctor Rosen Rosen's EP Girls Volume 1, pokes ironic fun at the melancholia surrounding it before getting to the wrought finale. In between these lighter moments is "After You," the album's best track and its most affecting (listen below). With its haunting chorus and endearing, emotional lyrics, "After You" musicalizes the conflicting and often overwhelming realization that falling in love is imminent and all but unstoppable, which for Myers especially means opening the door to pain and inviting it inside willingly. Instead of trying to verbalize the complex emotions involved, Myers lets the music convey what's in her head as she sings about what's in her heart. In the pre-chorus, the chords take almost a sinister turn, even as Myers sings about hope and comfort in a tone that's reluctantly optimistic. The moments are brief but powerful, perfectly representing the terrifying happiness that comes with falling in love for real. Daughter in the Choir is such stuff as fecund careers are made on. It's refreshing to find a gifted young female singer coming to us on her own terms rather than by the grace of an older male guardian. Myers' work will appeal to those drawn to the music of Lana Del Rey but perhaps turned off by the artifice that also defines her act. But the themes explored on this impressive debut and the manner in which they are presented should resonate with audiences of all tastes. Just as one didn't have to dig female rock to feel the catharsis of Alanis Morissette's "You Oughta Know," any fan or detractor alike can recognize what Myers means when she sings "my love: too much; your love: not enough." After all, it's not just Meg Myers - we all really want that poison, love. *The possibilities of the rock/electronica pairing have intrigued a few forward-thinking rock artists recently, notably the metal band Korn, who produced a dubstep album called The Path of Totality, and Foo Fighters, who participated in the "tribute to EDM" performance alongside Skrillex, David Guetta and deadmau5 during last month's Grammy Awards telecast.